Setting a specific duration of time to diet can motivate you to remain disciplined in order to reach your goal. Four weeks is a long enough period for you to establish healthy habits while also seeing results for your efforts. A number of factors go into determining how much weight you can lose in four weeks; combine healthy lifestyle habits with a sound diet and exercise program to see the best results. Maintaining a one to two pound weight loss per week is considered safe and improves your chances of keeping the weight off in the long term. 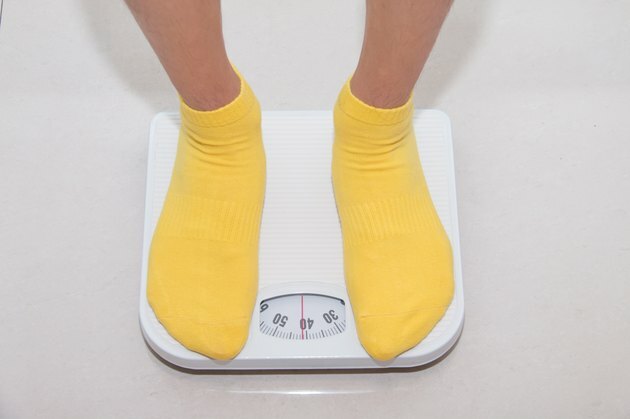 Losing weight faster than that is often the result of extreme or unsafe dieting methods; people who practice these types of methods, such as consuming exceptionally low calories, often gain the weight back again when they return to a regular level of caloric intake. Sticking to safe and healthy guidelines can result in a four to eight pound weight loss in four weeks. A pound of body fat is equal to 3,500 calories; to lose one pound per week, or four pounds in four weeks, you need to burn or reduce your caloric intake by 500 calories each day. You have to double that effort to bring your weight loss to two pounds per week or eight pounds in four weeks. Eliminating 500 calories per day through your diet is an effective way to reach your goal. While eating 500 fewer calories each day may sound intimidating, many people consume a good deal more calories than they realize. Write down absolutely everything you eat for several days; go over your list, and most likely you will be able to spot places where you can eat less without feeling deprived. Likewise, monitor your portion sizes and make sure that you are not eating more food at each meal than you need. Reducing refined sugar and processed carb intake, inreasing fiber intake and remaining well-hydrated will for many people result in a calorie reduction and an overall better more nutritious diet. An effective way to stay full throughout your day and still lose weight is to eat five or six times per day rather than just three. Consuming small meals that contain 200 to 400 calories every three to four hours can prevent hunger and keep your willpower intact. Additionally, filling up on low-calorie foods, such as fruits and vegetables, allows you to eat a larger quantity and remain satiated. Burning an additional 500 calories per day through exercise is an efficient way to take your weight loss to eight pounds in four weeks. Exercises, such as strength training, also increases your lean muscle mass, which can keep your metabolism running efficiently. Mix up your workout routines to include both cardiovascular and strength-training activities. An hour of running, indoor cycling, jumping rope, using the elliptical trainer or weightlifting can all burn over 500 calories.